The last one was in charge for only six months, but Alann Bedford Sampson is supposed to be temporary. Besides, she’s been chairman and was the interim director before this. With all of the talk recently about the empty-musical-chairs game being played in the management offices in Dallas’ Arts District (the Dallas Symphony, the Dallas Opera and the Dallas Museum of Art all having lost directors or presidents this year), we’ve forgotten: The Van Cliburn has been without a president since June — when David Chambless Worters resigned, having served only six months. Before him, you may recall, it was Richard Rodzinski in charge — for 23 years straight. Now comes the announcement that Alann Bedford Sampson is stepping in as interim president and CEO, effective September 1 — two weeks before the Cliburn concert series starts up again for its 35th season. Sampson served as the Cliburn’s chairman of the board from 1994 to 2011 and stepped in as interim executive director when Rodzinski left in 2009. She’s in charge as the Cliburn prepares for its 50th anniversary season next year, with the 14th International Piano Competition in 2013. Foundation will soon launch international search for new president and CEO. 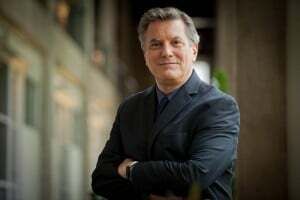 FORT WORTH, Texas, August 25, 2011—The Van Cliburn Foundation has appointed Alann Bedford Sampson as interim president and CEO as it prepares to conduct an international search to permanently fill the position. Sampson assumes the role effective September 1, 2011. Alann Bedford Sampson served as the Cliburn’s chairman of the board from 1994 through January 2011. Mrs. Sampson began her years of service to the organization as a volunteer usher at the first ever Van Cliburn International Piano Competition in 1962. She hosted Gold Medalist Cristina Ortiz during the 1969 competition and was continuously involved with the competition committee for many years following. 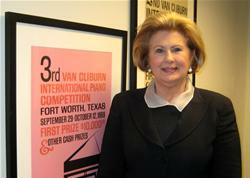 A member of the board since 1971, she organized and was president of the Cliburn Council, the predecessor to the International Association, in 1975. A passionate advocate for music as an essential element of a vital daily life, Mrs. Sampson produced the inaugural Cliburn Concerts series in 1976. During her distinctive 16 years as chairman, she oversaw four Cliburn Competitions and five Amateur Competitions. From October 2009 to January 2011, Mrs. Sampson served as both chairman and interim president. She has recently been serving on the board as chairman of the Foundation’s 50th Anniversary celebration. The Van Cliburn Foundation opens the 35th season of its lauded Cliburn Concerts series—often called the premiere classical music series in North Texas—on September 13, 2011 with Louis Lortie’s performance of Franz Liszt’s Années de Pèlerinage in honor of the composer’s 200th birthday. This season’s line-up also features such superstars as Yuja Wang, Joyce Yang, Deborah Voigt, and Emanuel Ax. Subscriptions and single tickets are on sale now at 817.212.4280 or www.cliburn.org. With students heading back to school, the Cliburn is also eagerly gearing up for Musical Awakenings®—which delivers top musical talent and a medium grand Steinway to schools across Tarrant County for one-of-a-kind, interactive educational programs. As plans are being finalized for the 50th Anniversary festivities next year—including a special gala event on March 3, 2012—preparations for the Fourteenth Van Cliburn International Piano Competition, to be held May 24 to June 9, 2013, are also well underway. March 2011 saw the announcement of the key competition artistic collaborators: Conductor Leonard Slatkin is slated to conduct the Fort Worth Symphony Orchestra during the Final Round, and the Brentano String Quartet will perform with all Semifinalists. The Foundation expects to announce the commissioned artwork for the Fourteenth Competition in fall 2011 and will launch an entirely revamped Web site, complete with an extensive digital archive, in January 2012.